After a long hiatus I received 3 more of the Traveling Art Journals. I thought it was going to take me forever to finish them, but I cranked these babies out in 1 week. I think I work better with prompts. This prompt was about our studio time. To be free and what goes on behind the doors of our studio. To me that means free time. Time to do what I want and play and splash and have fun. Every time something new happens. I used wall paper for the background, glued it down matte gel medium, then colored with pastels - brown, light brown, orange brown and beige. Set it with white gesso. 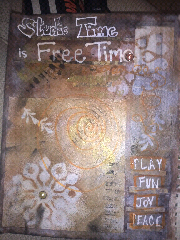 Used some stencils I made with my cricut and tried my new spray inks. Then added some black ink for texture, some doodles and writing in white corrector pen. I added some brads in the center of the flowers and finished off the edges with black ink. Love how it came out. This prompt was for song lyrics or music themes. I love "She Talks To Angels", by The Black Crowes. I have always liked that song, associated myself with the character. I used black pastel for the background and set it with clear gesso. I have black gesso but I couldn't find it (don't ask). 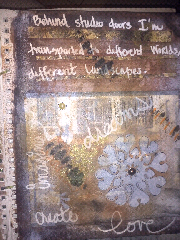 I then glued on some wall paper - the cave, white border, and the checkered background lines. 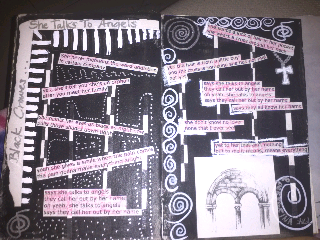 Added the lyrics, and some white corrector pen lines falling along the sides and above the title. I used a silver sharpie and white marker sharpie to doodle some dots and spirals. Used white color pencil to outline the words on the second page and to fill in the cross I drew. I digress. I love the sequence and so that is what I did. I started off by using ink to stamp for the background. I had a ink stamp built like a teardrop that I used like a stamp then smeared the color all around the area. 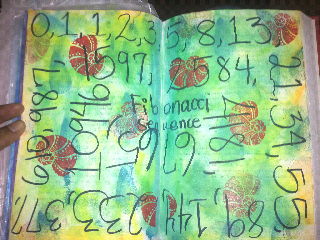 At that point I was stuck, went to Michael's and found a Nautilus Shell stamp!! If you watched the video you know this was an awesome find! I used a black sharpie to write out as much of the sequence as I could and filled in the name in the Middle. I love the simplicity of this and the colorfulness of it. So different from the other two that I did. I think I'm going to start trying to use lighter colors and maybe water colors. I need to pull out my watercolor crayons and pencils. I have a few other projects I'm working on but I'm excited about the tote I made...post to come. Thanks for hanging with me. Wow this looks like it was a lot of work! Looks very cool! Thank you! It didn't feel like a lot of work. Appreciate the comment!